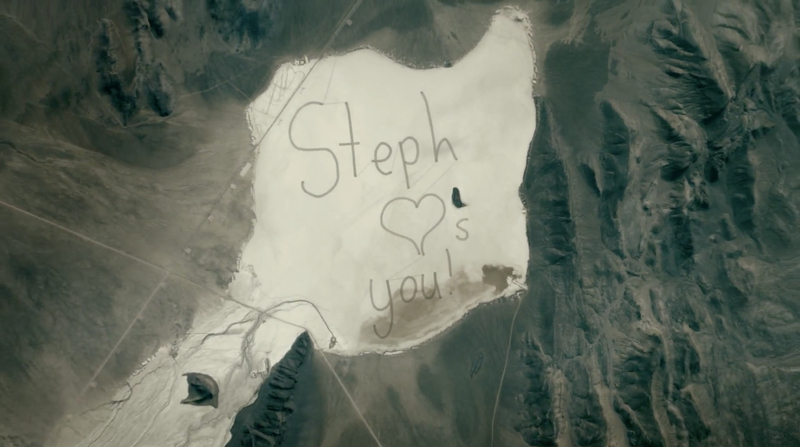 Hyundai is running “A Message To Space”, a film in which a 13-year-old girl from Houston, Texas, sends a giant hand-written message to her father, an astronaut on the International Space Station. Using the Delamar Dry Lake, Nevada, US as a blank canvas, Hyundai Motor dispatched 11 Genesis cars to write an epic message covering an area more than one and a half times that of New York City’s Central Park. 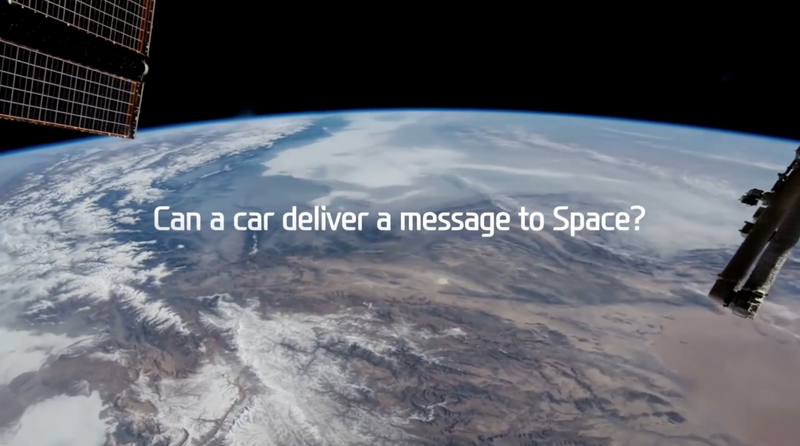 Terry Virts, commander of Expedition 43, was able to capture the message in film. Measuring 5.55 km2, the creation has been officially recognized as ‘the largest tire track image’ ever by Guinness World Records. 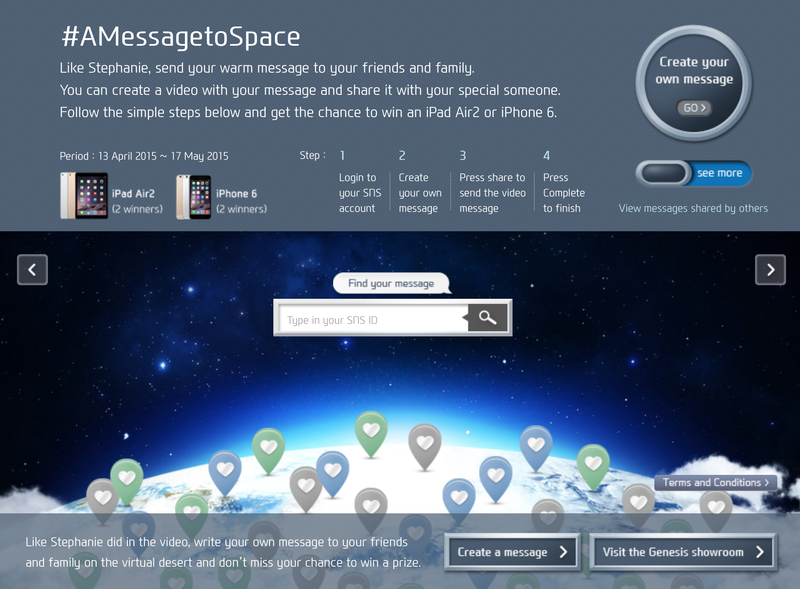 The official campaign site, amessagetospace.com, hosts the video, the behind-the-scenes video, along with an opportunity for people all over the world to share a virtual message with friends or families. 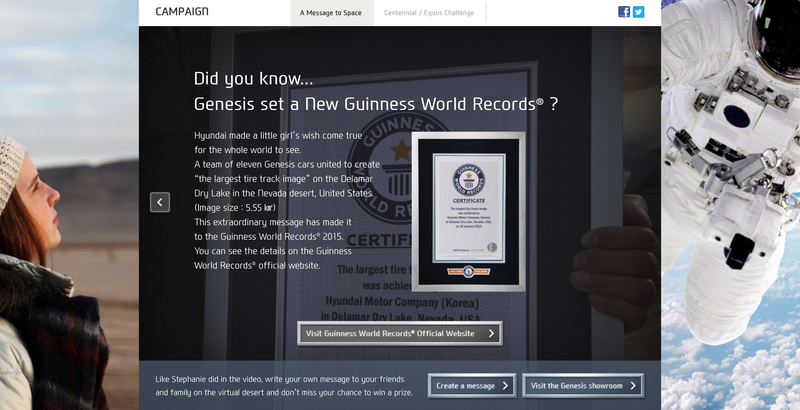 Experts from Korea, Europe, and the United States gathered to successfully deliver the ambitious project. Firstly, the team had to identify optimal locations based on numerous geographical and meteorological factors. After several expeditions to various locations, and analyzing global weather data, Delamar Dry Lake in Nevada was selected as the most optimal destination. 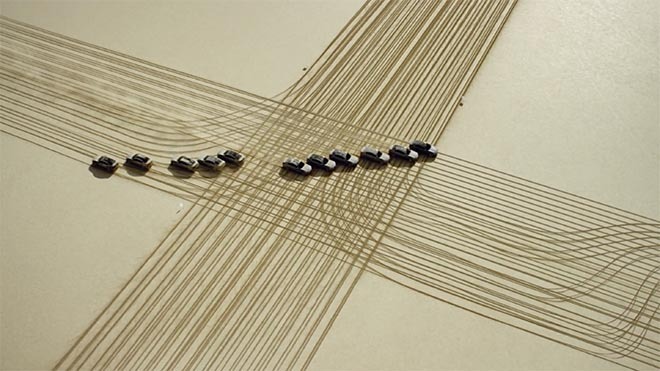 The whole event proved challenging and required a vehicle with outstanding engine performance, precise handling, a proven powertrain, and excellent driving stability to cope with the rough surface while creating the elaborate message. The Hyundai Message to Space campaign was developed at Innocean Worldwide, Seoul, by creative director Gunny Park, art directors Youngill Jang, Yonghee Kim, Seoyeon Cho, copywriters Jaeshik Seo and Mijin Lee, account team Eunjung Ahn, Euisung Ha, Jeehye Ryu, Jee Roh, producers Hojun Roh, Nuri Hong and Myunghwa Song. Filming was shot by director John S Park via Planit and Duofilms with assistant director Sung Bin, production designer Vincent Reynaud, directors of photography Patrick Duroux and Michael Fitzmaurice. Post production was done at Vixen Studios by VFX supervisor Yeonsu Kim, 2D artists Sejoon Park, Kwangseon Seo, Hanjoon Lee, Yeonwook Kim, 3D artists Kyungho Park, Youngjin Jeon, Seuogwon Kim, Minje Kim, Seunghun Lee and Seong-gyeong Je. Music is a waltz by Johann Strauss II, “Fruhlingsstimmen (Voices of Spring), Op. 410”, performed by Austrian Radio Symphony Orchestra.